Yes, congrats China, you got a rover to the moon in 2013…United States has 3 on Mars and had humans on the moon before 1970…good job indeed. So tell me, what have you personally contributed to space exploration? Bet you cant even tell your arse from Uranus. What do Layne’s personal accomplishments have to do with China’s space program? He’s simply pointing out that this isn’t a groundbreaking achievement, although China should be congratulated on their foray into becoming a space faring nation. Let’s just keep a bit of perspective. If China puts taikonauts on Mars, I’ll be impressed. And now Russians ferry American astronauts to the ISS. How the times have changed, eh. Cool, I wish it had landed near the Apollo site. I’d just as soon leave the Apollo sites alone for the time being… they should become world heritage sites and protected for future generations. Congratulations China on this excellent achievement! Thank you China (Beijing Aerospace Control Center) for your openness and sharing this fantastic voyage with the world! Congratulations! ????? (Zài zh?ngguó zhùhè) We hope your mission goes well and you continue to share the science and excitement we all expect and feel! WOW! Thanks for sharing your success with us. I hope to be able to follow China’s successes in space exploration for years to come. Will never happen, this country has been turned over to anti-science, blood sucking thieves* who think the national treasury is their personal checking account to be spent on wars of choice and oil production. If you want space exploration then discover a Spindletop under Olympus Mons. I’d much rather spend the ever decreasing U. S. investment in space exploration on unmanned rover or probe programs to Titan, Europa and Enceladus. In the unlikely event NASA’s budget ever sees an increase again, then I’m in favor of returning to the Moon. With current investment levels, I fear that manned programs will be the province of China. What a shame. 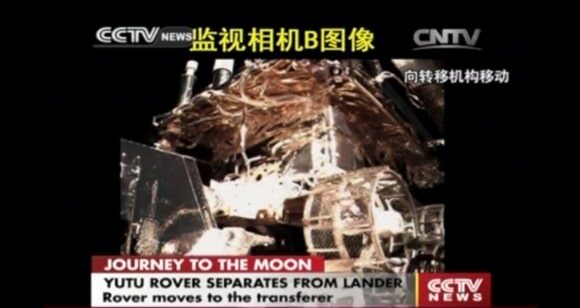 Hopefully, China will become a valuable partner in the international space exploration program. It will take a world effort to create a permanent space station on the moon on which we can build a space port to visit the solar system. Fantastic ,a Giant Leap For China, well done, 10 points out of 10, thank you China for these great pictures and continued success………..
Those giant leaps will be measured in metres, not that obsolete crap used by Americans. No wonder the US keeps sinking into the abyss. A giant leap for botkind. Now let’s get a telescope up there. I believe the lander is equipped with one. One of tasks is to look at the earth’s atmosphere. I am so glad to hear of China’s successful Moon landing. I hope that it is just the beginning of a long and successful space program. The interesting thing is here too you see no blast crater. The video states that the lander intentionally turned off it’s engine during the last part of the descent to keep dust from interfering with ops. Low Lunar gravity means less acceleration, which they took advantage of… very clever! I awoke early this Sunday morning and first thing I did was to check if there were any new images from the Chang-e 3 lunar rover! Excited? Yessss…. Similar, in an off-world way, to the MER rover Spirit, Chang-e 3 appears to have landed next to an interesting crater – instead of IN one. Never-the-less… here’s hoping they decide to ‘poke around’ a bit in and around that crater? Some interesting ejecta? The data from the ground penetrating radar should be quite interesting. Cool! Looks like the rover made a 180 deg turn (see the tracks on the ground) and showed the side with the Chinese flag to the lander. strange isn’t it that nasa just had to have LADEE up there before the Chinese got there…maybe just to keep an extra special eye on the Chinese and what their really up to !!! mmmmm just surmising..
anyhow well done china !! and, sharing these mission data with the open world…! Tell me they landed close enough to our old moon stuff so they can take pictures and stop all the ‘we never went to the moon’, idiots! The lunar landing deniers will never be convinced. They will just claim that is also a fake. Good job. I’m rooting for to walk many kilometers. And whereas, therefore, is do the research, so noble that you want. It is showing that China also has its interest, which can, and, like the U.S., share your findings with humanity. Beautiful images and a show of engineering. I have no doubt that the exploration of humanity through space, the future holds for China and the Chinese, is so essential to success. Congratulations from Brazil! Congratulations China!!!! Where do I click the LIKE button? So where are the borders between USA territory, and Chinese territory? Nobody likes a smart arse Doug! you asked a simple question, you got a simple answer.